Words and images by Caitlin. Veganized: A series in which Caitlin attempts to create veggie-friendly versions of favourite dishes old and new. I’m a lifelong vegetarian, raised by parents who’ve been off the meat since the days of buying textured vegetable protein in bulk off the back of a hippie-helmed truck. But I’ve definitely dabbled in meat eating, or as I prefer to think of it, flexitarianism. Bacon was my gateway drug. More specifically, it was beet greens fried in bacon fat, served up by a handsome man who grew the beets–the things we do for love. My love affair with meat lasted just a little longer than my relationship with my first enabler, and I don’t regret a single delicious bite. Here’s the thing about life–it’s too short not to eat a grouse your boyfriend just shot in the wooded driveway, too short not to order a peanut butter sandwich with bacon on a hungover Sunday afternoon in Greenwich Village.The little things are the big things, as it turns out. And that sandwich was a Big Thing. It was the winter of 2011, and I’d just up-ended my life to move back to my hometown. It would all turn out to be the right thing, but I didn’t know that yet, and so I took my last few days before starting a new job to run away to New York City. 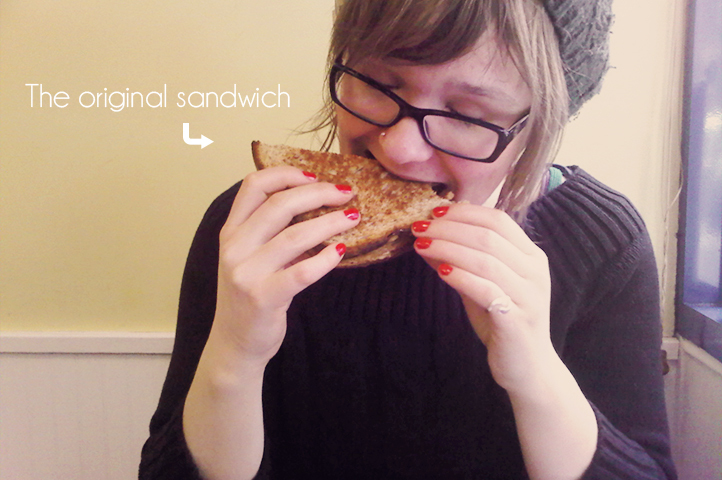 One meandering, mildly hungover Sunday afternoon, my best friend and I wandered hungrily into the Peanut Butter & Co. Cafe. It didn’t take much prompting to convince me to order the Elvis: PB, banana, and bacon. It was the most delicious sandwich I’d ever had in my life, made all the better by the bustle of the Big Apple outside the window and the overwhelming sense that every crazy decision I’d made in the last few weeks had somehow been leading up to this mouth-watering moment. In the years since that perfect meal, I’ve landed firmly back on the vegetarian wagon. But I’ve dreamed about that sandwich many times since, and I firmly believe that everyone deserves the chance to taste that perfect blend of salty, sweet, crunchy and rich flavours, that strangely satisfying combination of the homey and the exotic. 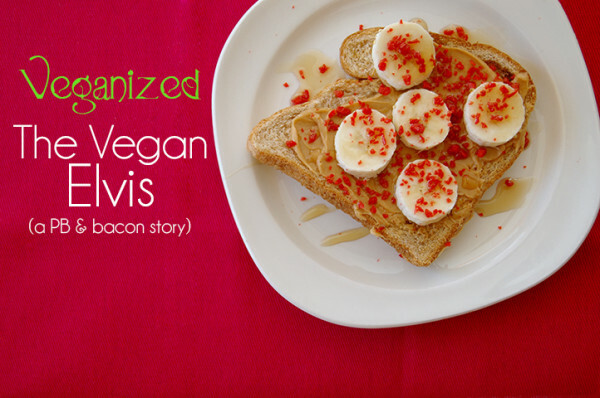 That’s what set me on the fool’s errand that inspired this piece: veganizing bacon. Look. I know that trying to veganize bacon is essentially the Titanic of foodie experimentation: doomed from the start. Please don’t lynch a gal for trying. I’m even okay if you make this sandwich with real bacon. But if you’re vegetarian, sometimes you have to get creative, and that’s what I’ve tried to do. I had a few false starts, including fried and crumbled tempeh, marinated first in soy sauce, maple syrup, and smoked paprika. The tempeh was delicious on its own, but overwhelmed the other ingredients. I also gave it a go with processed veggie bacon, but the brands I tried were closer to bologna than actual bacon, and didn’t mimic the essential crunchiness of the real thing. In the end, I settled on bacon bits (most brands are soy-based! Who knew?). Fancy and healthy they ain’t, but like I said off the top, life is short. A few other late additions helped play up the taste dynamics that made the Peanut Butter & Co. original so irresistible: The vegan mayo may sound weird, but just a schmear goes a long way, I promise. A drizzle of maple syrup was a last-minute stroke of genius. So what’s the moral here? Some things can’t be fully veganized, but that’s okay. Most once-in-a-lifetime meals can’t be recreated, but the memory of them remains, inspiring us to try and try again, with love and creativity and few stumbles along the way. Toast the bread and spread the peanut butter on each slice. Spread a thin layer of mayo on one slice. 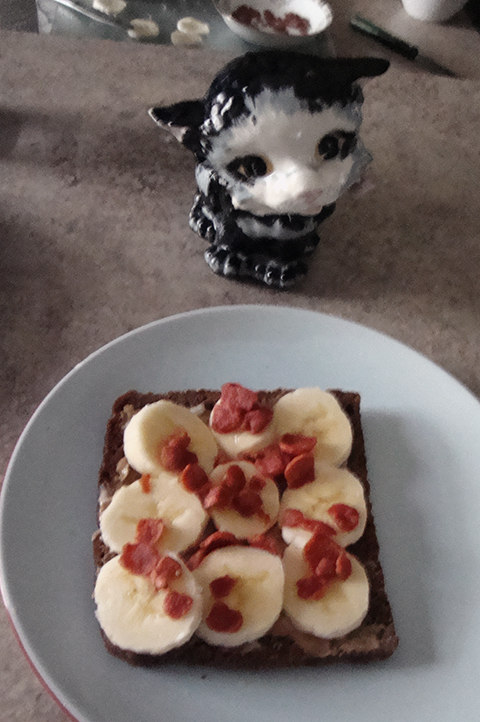 Top with sliced banana and bacon bits. Drizzle with maple syrup and serve. Say a small prayer of thanks to the strange taste buds of Elvis Presley. Way to veganize the food of my death…I’m totally going to look for Faken bacon bits tomorrow. Sorry, Ship. Oh wait, no, I’m not sorry. Were any ceramic kitties harmed in the making of this great vegan treat? Not to worry, if there were a PETA for ceramic animals I would be their president. Hey hey, looks great. I can’t wait to make the carnivorous version. I’m not really a banana fan, but we’ll see.